I have a friend who likes to collect interesting videos on the YouTube and share them to his friends. He usually prefers to make videos into a collection so that he can edit and rearrange them as he wants. Since he doesn’t have the expertise in video editing, he just can use some simple video editing programs like Windows Movie Maker. But he finds that it is hard to import YouTube video to Windows Movie Maker directly sometimes. So he asked me for help to solve the problem that convert YouTube to Windows Movie Maker. I don’t think he’s the only one who has ever had this kind of confusion. Therefore, today in this post I will introduce a very practical method to help you converts YouTube to Windows Movie Maker. To solve the problem, the first thing you need to know is some basic information about Windows Movie Maker. It is formerly known as Windows Live Movie Maker in Windows 7, a discontinued video editing software program developed by Microsoft. 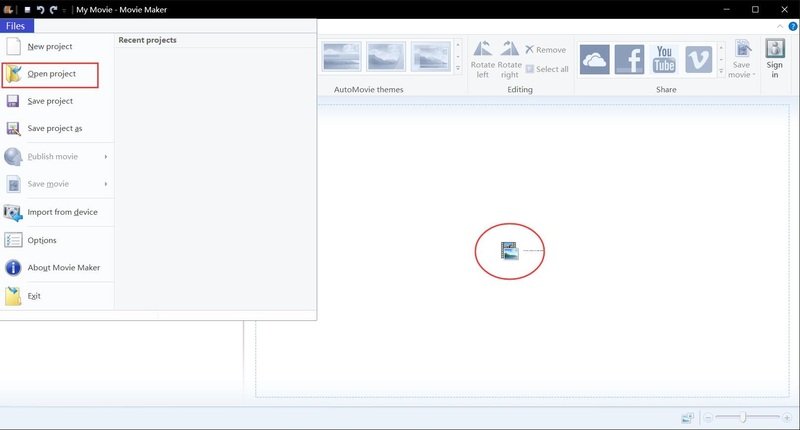 You can use Windows Movie Maker to create and edit videos as well as to publish them on OneDrive, Facebook, Vimeo, YouTube, and Flickr. Although it has been officially discontinued and replaced by Windows Story Remix in 2017, many users are still like to use it for some simple video editing jobs. In general, Windows Movie Maker is a free and excellent video editing program which can satisfy most of your video editing needs. However, Windows Movie Maker does have many useful video editing functions, but the video format that it can support is limited. According to its official website we can know that the video formats it supported is WMV, ASF, WM, M2TS, MTS, M2T, MOV, AVI, and DVR-MS. 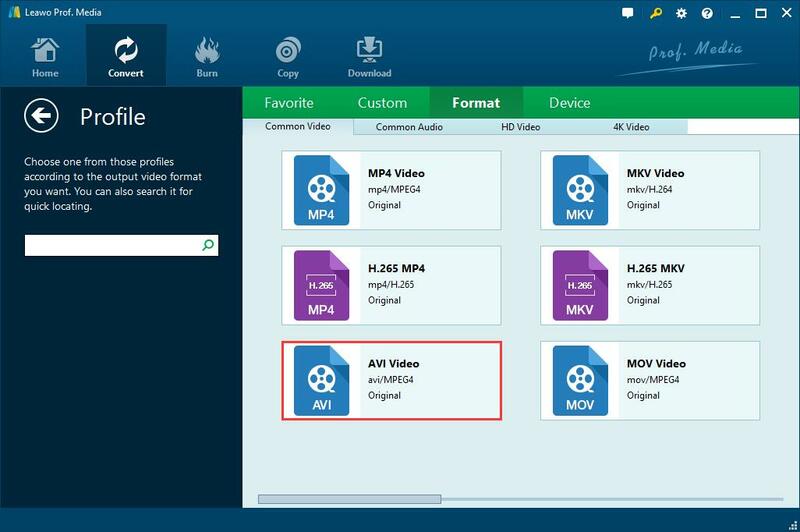 In addition, Windows Movie Maker can also support many audio formats including AIF, AIFF, WAV, M4A and MP3. Unfortunately, not all the YouTube videos can be downloaded in the right format supported by Windows Movie Maker. That’s the reason why we need to convert YouTube to Windows Movie Maker. The basic procedure to complete this conversion can be summed up in two main steps, download video and convert them to Windows Movie Maker. Hence, In the next two parts I will show you how to use video downloader and converter to do this job. First of all we need a video downloader to download videos from YouTube so as to import to Windows Movie Maker for editing. Although you can find a very large number of downloaders on the Internet, I think Leawo Video Downloader is the most reliable one. Leawo Video Downloader is one of the most famous video downloader around the world. It is the top-of-the-line online video downloader with powerful download ability and simple operation interface which can download videos from more than 1000 sites like YouTube, Myspace, and CBS and so on. So I think Leawo Video Downloader is the best choice for you to download YouTube videos. Here you can download and install Leawo Video Downloader and then follow the steps below. 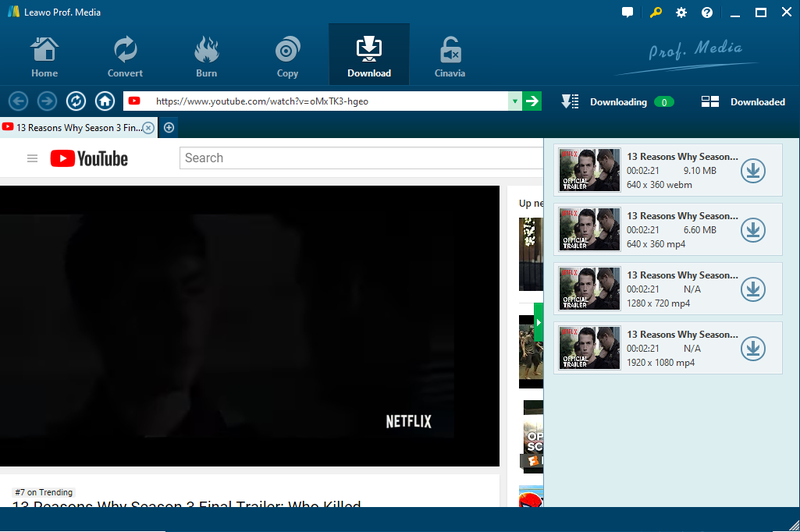 Open the main interface and find the “Video Downloader”. Click it you will automatically enter the YouTube home website. Or you can paste the target video URL in the address box. After entering the website you want you need to call out the wait-to-select panel by clicking the green arrow on the right side. Select the one with the format you need to download. And then click the download icon. Finally, what you need to do is clicking the green “Download” button. After that Leawo Video Downloader will begin to download the video you have chosen. The videos downloaded by video converter are usually in MP4 or WebM format, neither of which can be imported to Windows Movie Maker, therefore a YouTube to Windows Movie Maker converter is necessary for this job. In this part I want to recommend you the best video converter to you – Leawo Video Converter. Leawo Video Converter, one of the most famous video, converts around the world which supports more than 180 different videos and audio formats such as MP4, MKV, AVI, MP3, and MOV. There is no doubt that Leawo Video Converter can help you to convert YouTube to Windows Movie Maker supported formats and you will love it for its simple manipulation interface and efficient video conversion as long as you make use of it. Download and install Leawo Video Converter and then follow the guide below step by step. Open Leawo Video Converter to enter the main program interface. Add your YouTube video by clicking the “Add Video” button and call out the drop down menu near the “Add Photo” button to change the output format. AVI is included in the supported list of Windows Movie Maker, so here I will take AVI as an example. After importing the video, you can find that there are many categories of submenu on the formats selecting window. What you need to do is choosing “Common Video” and selecting the AVI as the output formats. Finally, back to the program interface and click the green “Convert” button, set the output file on the popup sidebar. After that you will get your converted AVI audio soon. Note:If you are new for using Windows Movie Maker and don’t know how to import the converted video into it. Don’t worries about that because you just need to click the “Files” menu on the top left corner and find the “Open project” button which can help you import the videos in it. If you want to import videos in other formats like MTS to Windows Movie Maker, the steps are as simple as above. To be brief, both Leawo Video Downloader and Converter do this job well. The use of these two programs makes the complex and cumbersome conversion much easier. At the same time, they have given you a very satisfying experience. 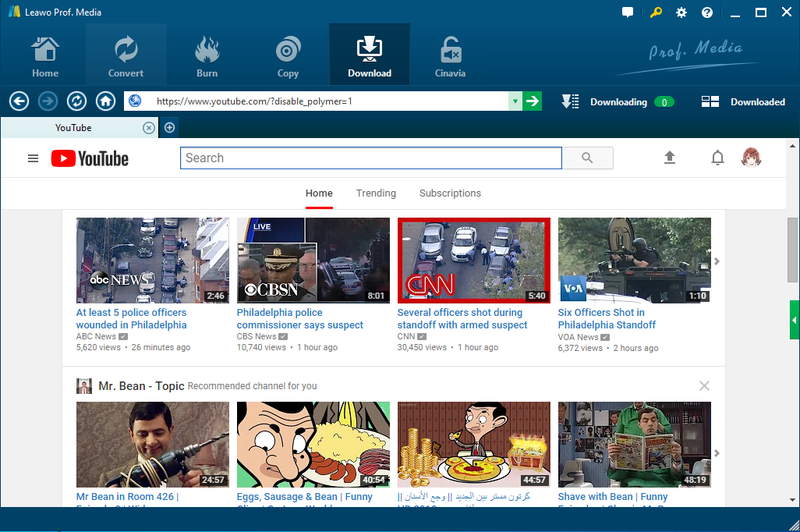 In my opinion, Leawo Video Converter and Downloader are the best choice for YouTube to Windows Movie Maker conversion.